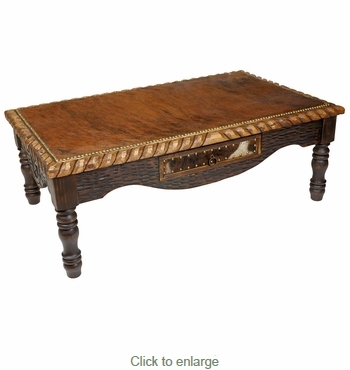 This handcrafted western coffee table with cowhide top and drawer face exemplifies the history and spirit of the West. Turned legs with chiseled front and sides are accented by a carved braided rope design edge and carved lone star on the sides. The top and drawer face are edged with brass clavos. The one-of-a-kind character of our western furniture is enhanced by the light and dark patina stains and premium selected cowhide. Handcrafted by artisans in Mexico, our western cowhide furniture is perfect for southwest ranch or cabin decor. Each piece is a unique creation, so expect some variations in appearance of cowhide and stains.